Long Beach CA.,Apr. 16, 2016 – Ford Chip Ganassi Racing narrowly missed a podium finish with the No. 67 Ford GT and clocked the quickest lap of GTLM with the No. 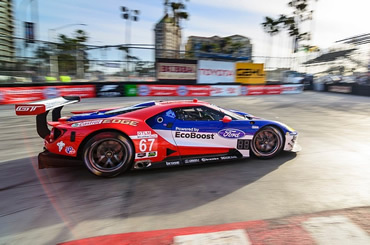 66 Ford GT in what was another growth weekend, this time on the streets of Long Beach in the third round of the IMSA WeatherTech SportsCar Championship. Dirk Müller drove a mighty stint capped off by a blistering 1:17.934 in the closing laps of the race, but was by then laps down from an early issue with a door latch on the No. 66. In the meantime, Ryan Briscoe steadily moved up in the ranks in the No. 67, thanks to a solid start by co-driver Richard Westbrook, his own competitive lap times and a few key cautions that sidelined the leaders. The No. 66 Ford GT took the green flag from the last position after choosing to switch tires after qualifying. Then, right after Joey Hand took the green flag, the door popped opened. Hand pitted for repairs and handed off to Müller, who drove the rest of the race to a p8 finish. “After we fixed the issue with the door, the car was very good,” Müller said. “I had lots of fun out there. Again, good data for Le Mans. 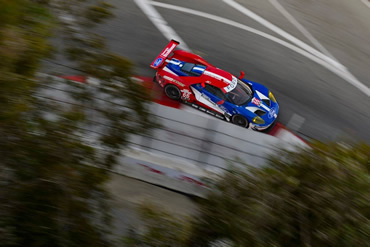 I thought we had the car to fight for a podium here, so I’m a little disappointed, but we need to understand why we had that issue, fix it and look forward.” Ford Chip Ganassi Racing will now head to Laguna Seca, Calif., where the IMSA WeatherTech SportsCar Challenge will race May 1.